When Kate first contacted me about covering the Star Wars Half Marathon weekend and told me that she had a cat named after a Star Wars character, I knew she was perfect for the job! She took on the Inaugural Rebel Challenge and took on half of the challenge with her 10 year old son…how fun! 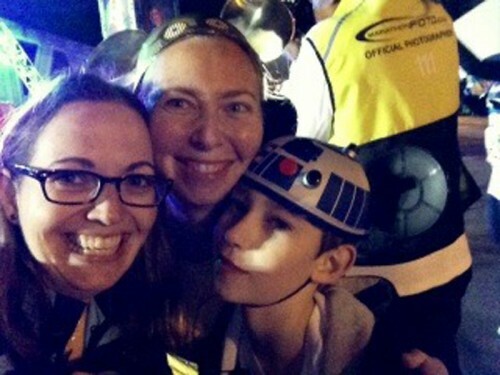 I love when parents make runDisney events a family affair. 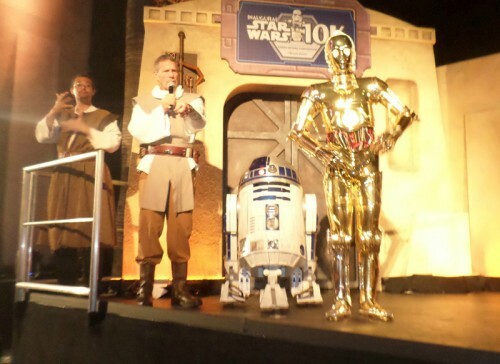 Here is their journey to a galaxy far, far away. 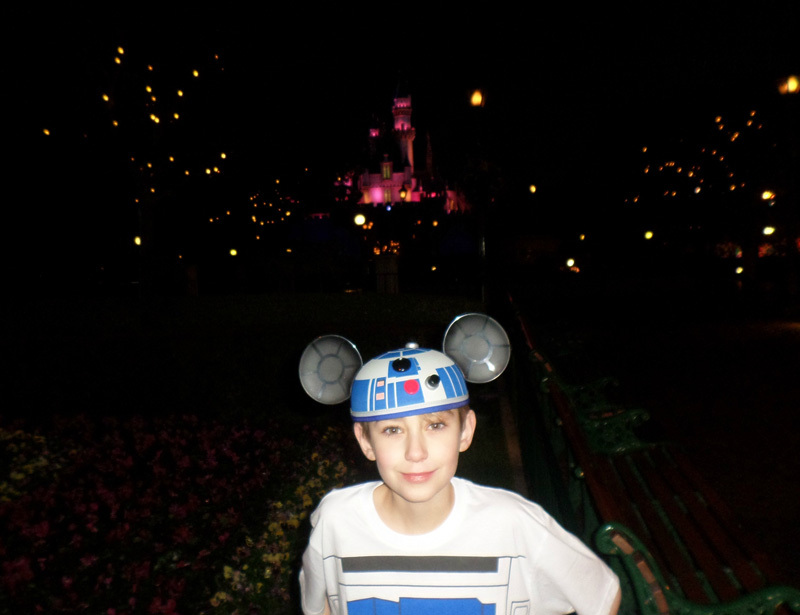 The costume decision was pretty easy – I ordered R2D2 and C3PO shirts off Amazon and had Lori (my Disney race companion) grab the mouse ears in WDW – although there were plenty at the Expo. Unfortunately, the Artoo shirt only came in men’s sizes, so it was a bit big on Russell, and mine came with sleeves, which I hate and therefore cut off. 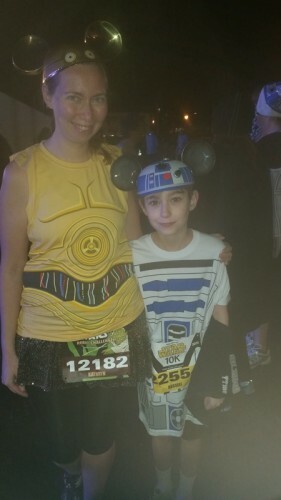 I made the rainbow sparkle skirt (Sparkle Skirt DIY Info) for a previous race, and we couldn’t convince the boy to wear Lori’s blue sparkle skirt. Because he is no fun. The boy was a bit grouchy about getting up at 3:30 am, but he gamely made faces at the cameras. We watched some of the preshow, did our force push to save the hosts from Darth Vader, and headed to the corrals. 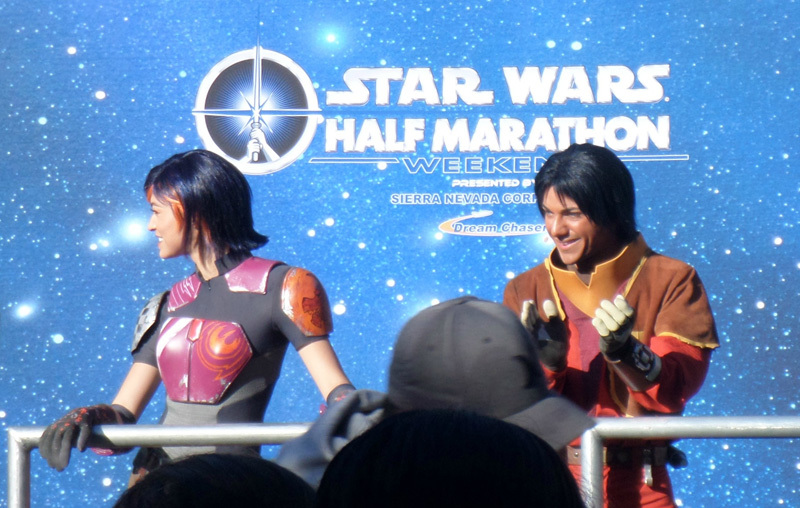 Star Wars font makes everything seem awesome, even the fact that there’s a million people between you and the start line! We all started in D with Russell, the lowest ‘seed’ of our trio. See, a million people. 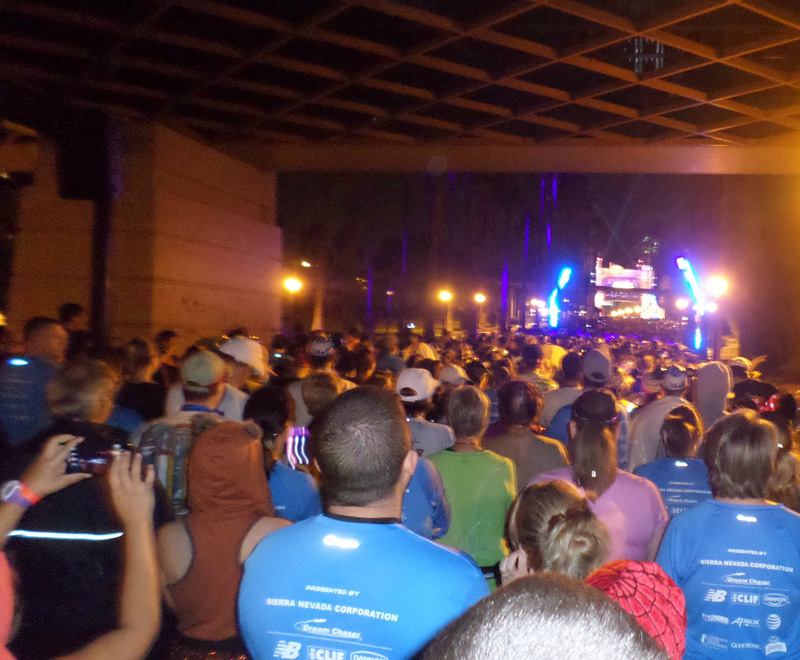 Though they didn’t have the fireworks of a WDW race, the start line was still full of energy and bright lights. Russell got a somewhat shocked shout-out from Rudy as we crossed the start line – yay for being one of the youngest runners! 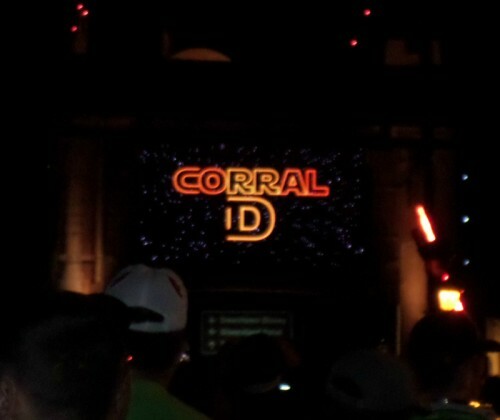 Knowing there was only one corral behind us, we expected a lot of walkers, but we figured we could dodge them and get moving. That never really happened – there was such a mass of people that it was impossible to weave through. But pretty much everyone was dressed as a Star Wars character, so you can’t get mad at a guy on a tauntaun. The beginning of the race was on roads leading along the edge of the parking lots and parks, but we were back in the parks in under two miles, and either in park or backstage for the rest of the race. Seriously. 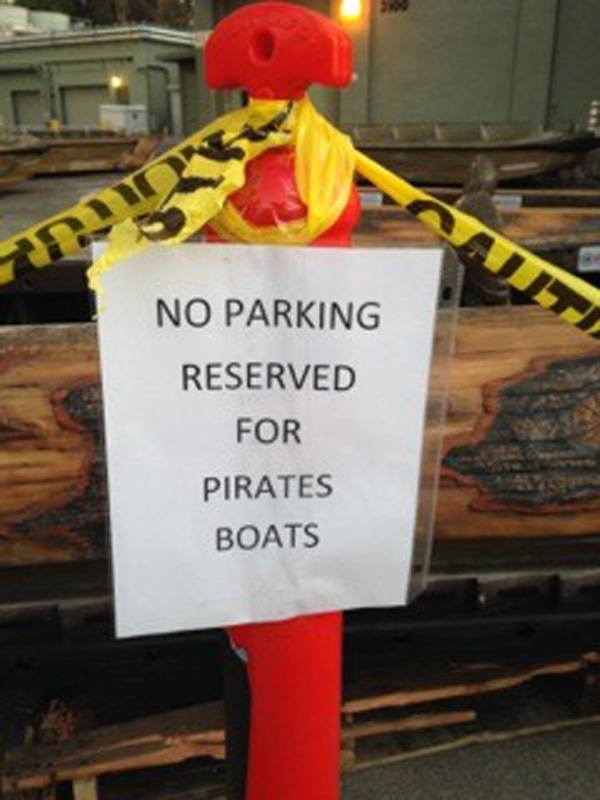 Park your cars elsewhere. 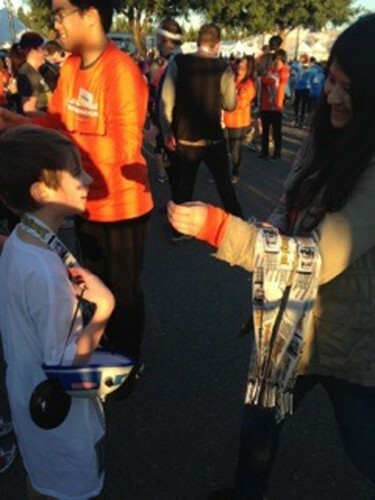 Which is awesome – both for regular runners and young runners. 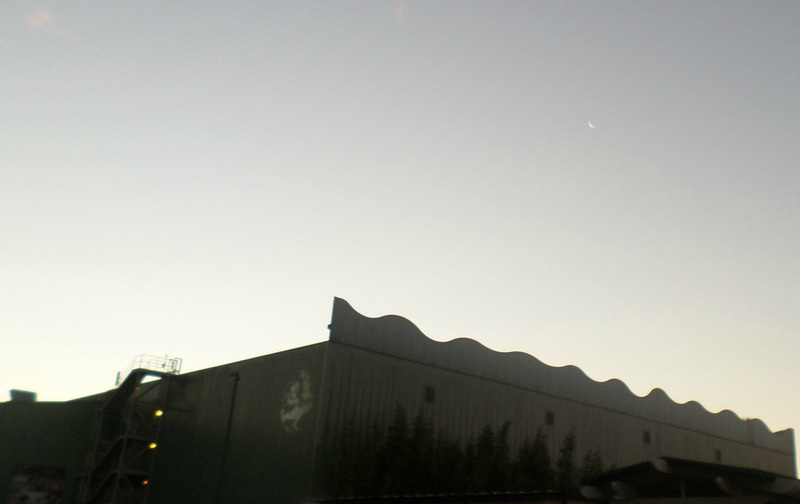 Russell was thrilled by seeing parts of the Matterhorn in refurb and all the other random backstage things. I was in the College Program at WDW, so backstage isn’t really new to me, but it made me smile to see him see these things for the first time. 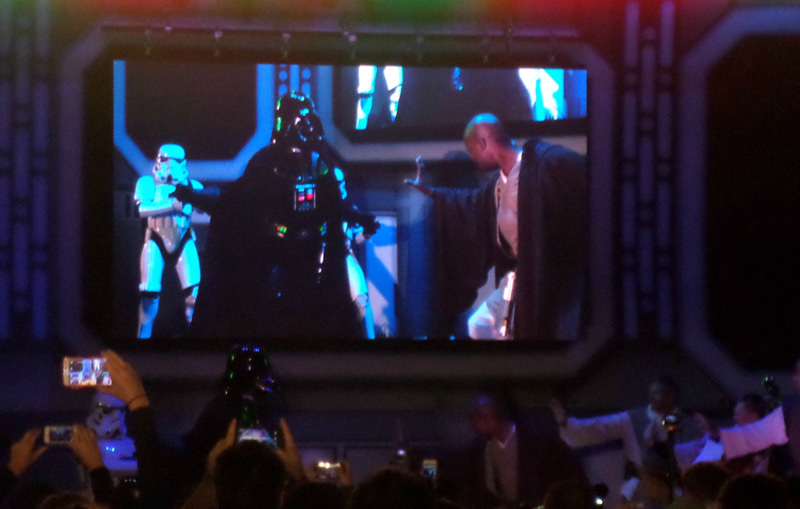 Disney kept things interesting by having Darth Vader’s voice echoing through the one tunnel (and the one mean little hill out of it!) and various Star Wars stuff projected on the buildings. And of course, Star Wars music everywhere. That’s no moon. Wait, one is. But not the other one. Man, it must still be pretty early if we think this is hilarious. 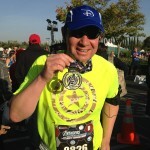 The finish was the same as ’12 Disneyland, around a backstage area and in between Downtown Disney and DL Hotel. Up till now, I had been impressed by the etiquette of the other runners – even though we were packed in tight, there wasn’t a lot of pushing or bumping. Up until a woman stopped a few feet from the finish line to take a picture…RIGHT IN FRONT OF ME. I nearly plowed into her, and ended up almost taking out Lori and Russell as I dodged her. Sigh. But we finished with smiles on our faces, collected our “real” medals, food and water, and headed to the Info Tent to pick up the younger child’s Kids Race bib. One down, two to go! 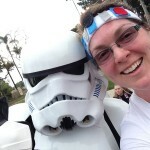 Kate Starcher is a quilt designer, blogger, Half Fanatic, former Disney cast member, and so much of a Star Wars nerd that she has a cat named Tycho Celchu. See her quilt hidden Mickeys on t-shirt quilts at katiemaequilts.com. 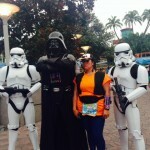 Run Your Buns Off at the Star Wars Half Marathon! 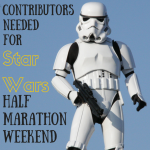 As a huge Star Wars fanatic, I NEED to run the Rebel Challenge. Sigh. One year.